Many interesting and useful items festoon the front, back, and perimeter of your Samsung Galaxy tablet. Different tablets place some features in different locations, however, as shown by the horizontal and vertical orientation of the different tablets. Due to the differences, ensure that you properly locate everything on your tablet. Touchscreen display: The biggest part of the tablet is its touchscreen display, which occupies almost all the territory on the front of the device. The touchscreen display is a see-touch thing: You look at it and also touch it with your fingers to control the tablet. Front camera: The Galaxy tablet’s front-facing camera is centered above the touchscreen. The camera is used for taking self-portraits as well as for video chats. Light sensor: Just next to the front camera is a teensy light sensor. It’s used to help adjust the brightness level of the touchscreen. It is not a second camera. Home key: Found at the bottom center of the tablet, the Home key serves many important functions. Menu and Back buttons: To the left and right of the Home key are the Menu and Back buttons, respectively. These are touch buttons, not physical buttons like the Home key. They also serve important functions. 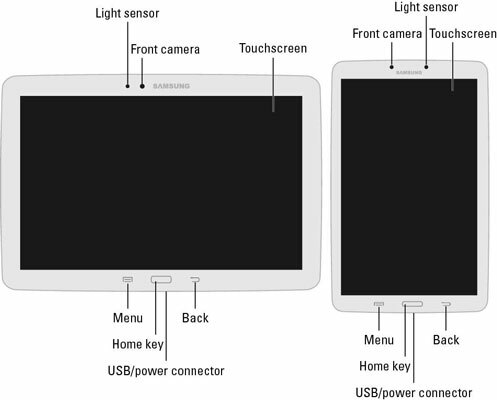 Power/USB connector: The Power/USB jack is located on the tablet’s edge, below the Home key. This is where you attach the USB cable to the tablet. It’s also where the tablet connects to an optional docking stand, keyboard, or other fun doodad. Press the Power Lock key to turn on the tablet, to lock it (put it to sleep), to wake it up, and to turn it off. Volume key: The tablet’s volume control is two buttons in one. Press one side of the key to set the volume higher, and the other side to set the volume lower. This key is found next to the Power Lock key. Headphone jack: On the top of the tablet, or high up on one of the sides, you find a hole where you can connect standard headphones. S Pen: The Galaxy Note features a digital stylus, which inserts into the side of the tablet. Locate the S Pen but keep it in its snug cubby for now. SIM card cover: This spot is used to access the cellular tablet’s SIM card, which is inserted into a slot beneath the cover. Media card slot: Lift the cover on this slot to add or remove a microSD memory card. Speaker(s): Stereo speakers are located left and right on the tablet, either on the sides or on the bottom edge. Microphone: A tiny hole on the tablet serves as the device’s microphone. The hole’s location may not be apparent — it’s about the diameter of a pin — but it’s there. Rear camera: The rear camera is found on the back of the tablet. It’s the only thing back there, and it’s kind of lonely. Be careful not to confuse the SIM card with the removable storage media (microSD card). They’re not the same thing. You’ll rarely, if ever, access the SIM card. SIM stands for Subscriber Identity Module. The SIM card is used by your cellular provider to identify your tablet and keep track of the amount of data accessed by the tablet. Yep, that’s so you can be billed properly. The SIM also gives your cellular tablet a phone number, though that number is merely an account and not something you can dial into or send a text message to. Don’t stick anything in the microphone hole. The only things you need to stick into the tablet are the USB cable (or the connector on the dock) or headphones.